I got to the pub quite early and it was already really busy, Rob said we had 19 booked in for today which I think is the biggest turnout so far and shows how well the pond is fishing. On the down side, I couldn’t have my usual sausage sandwich as they’d run out of bread! Along with most of the regulars, Karl’s brother Stuart was fishing with us for the first time and it was great to see Paul Homewood again. Rob announced the draw and I didn’t go in until there were only a few balls left and pulled out peg 5, not my first choice but at least it wasn’t peg 24! Everybody rushed off to their pegs and despite Rob reminding everybody before the draw not to forget the scales, both sets were still on the table, I’m not going to name names but I picked up a set for Adie and Rob did the same for Nick! I drove round to drop my kit off and I really do hope the club manages to get the parking issue sorted soon as it is a bit of a pain and I do feel for the older or less mobile anglers. With the level down, I set my box up in the water before mixing up some Bait-Tech Pro Nat Dark. 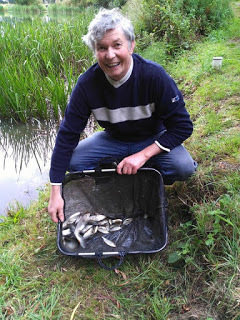 Rigs were the usual 0.5 gram Drennan Roach for fishing on the deck and a little Preston Chianti for up in the water. My neighbours for the day were Adie on my left and Hurf was on peg 4 with Baz along from him in peg 3, Jess ‘Zooner’ Jordan on peg 2 and a very hungover Jake was on peg 1. 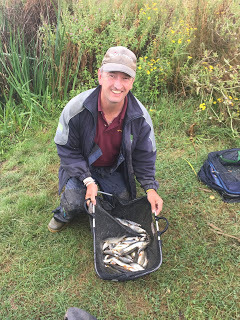 On the whistle I cupped in two balls of groundbait at 10 metres before starting with the hook buried in a caster, I missed a couple of bites before catching a small roach to get me up and running. 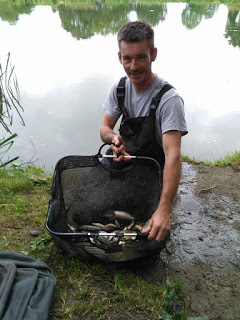 I had a really good first hour catching 38 fish, mostly small roach apart from a chublet and a couple of better rudd and I thought at an average of an ounce and a half apiece, I probably had around 3lb which wouldn’t be far off if I could maintain that catch rate. It was already obvious that the fish wanted to be shallow but I resisted trying the shallow rig just yet as I just can’t seem to do it right and catch those bigger roach. 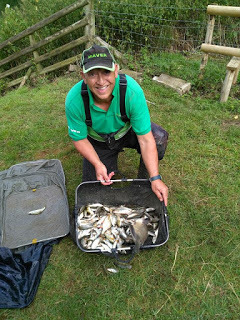 Adie had caught a couple of decent skimmers on the feeder so there probably wasn’t much between us at this early stage and I could see Fieldy swinging in small fish like a metronome over on peg 19 but apart from those two I couldn’t see a lot happening. The second hour saw my catch rate drop off so I tried the shallow rig and had two better roach straight away before missed bite madness took over and after the second sixty minutes I’d added another 26 fish to give me a total of 64 which was still slightly ahead of my 30 fish an hour target. 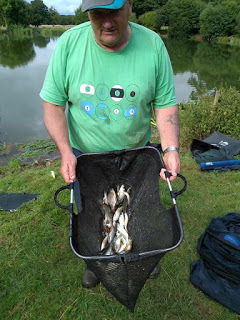 Adie had landed a couple more skimmers but was having to wait ages for bites and Fieldy had landed a nice skimmer, Big Frank came for a walk round and said apart from Fieldy nobody on the other side was bagging and he said Hurf, Baz and Zooner were struggling as well. I was still on the shallow rig but I just couldn’t catch any quality and as we reached the halfway point, my clicker was reading 88 fish and I’d dropped below my target. With two hours to go I was really struggling and probably stuck with the shallow rig too long when I wasn’t catching, I went back on the deep rig and started to catch well by laying the rig in and catching on the drop but it was mainly small roach although I did manage another chublet and a couple of better roach. 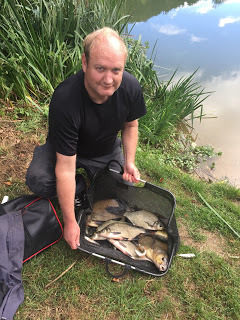 Adie was still getting the odd skimmer and would be there or thereabouts and then Steve ‘Nob Budd’ Parker hooked a big bream which he landed safely. 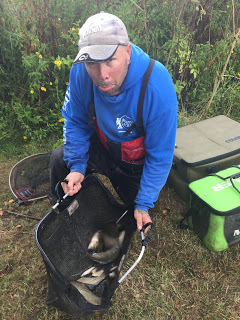 Baz shouted up that he’d been done in the lilies (sounds painful) by a big fish (probably a chub) on his light rig and had lost his elastic and everything. 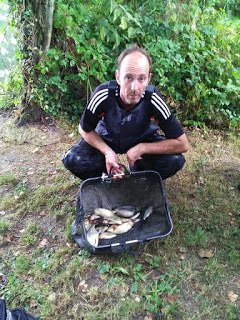 I kept swapping between the deep and shallow rigs and getting odd fish up until the end of the match and when the all out was sounded I was on 156 fish which I thought would give me 14-15lb. 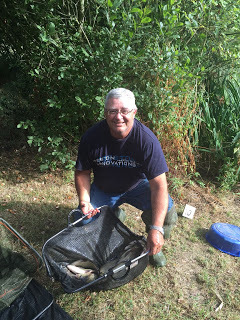 I packed up and we started the weigh in with John Dursley on peg 10, he’d caught a bream plus skimmers on the pole with corn to weigh 19lb 6oz and set the pace. 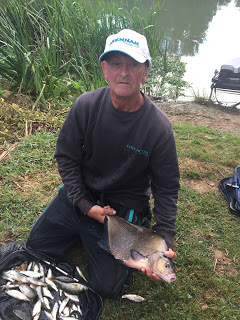 Terry had a big bream, a skimmer and some bits for 7lb 5oz from peg 9 and then Justin had two decent bream and some skimmers on the feeder for 15lb 12oz. 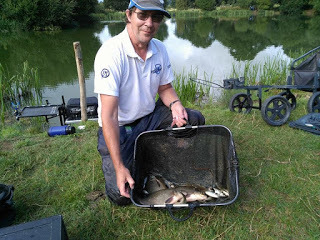 Steve P had 9lb 10oz which included a lovely slab and then when Adie pulled his net out he had a cracking net of skimmers and it was going to be close, after two weighs his total was 21lb 11oz and he got his revenge on John from the last match. Then it was my turn and I was disappointed to only weigh 10lb 2oz so the fish only averaged an ounce apiece and I’m still way off the pace. Hurf had really struggled for 1lb 13oz, Baz weighed 4lb 14oz and Jess didn’t weigh so it had been hard going for some. 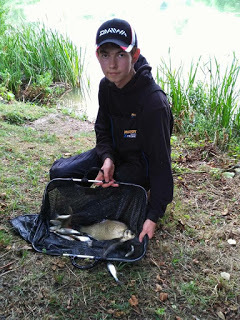 Last to weigh in our section was Jake and he had a nice chub and several skimmers and if he beat me, he would take the side bets, it was close but the needle settled on 9lb 8oz so at least I had three nuggets to come. 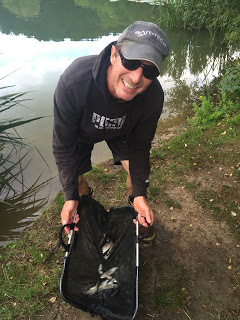 Hurf had struggled for 1lb 13oz but he was still smiling! 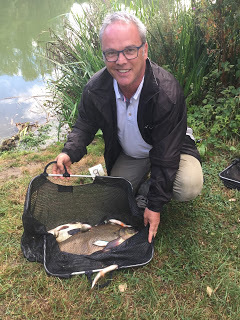 After nine matches and dropping the two worst results, Fieldy has one hand on the league title as he increased his lead to three points over Ash who didn’t fish today. So although the pond continues to fish really well, my bad run continues and I’ve now gone two months without a pick up and I can’t ever recall having such a barren spell. To be honest I’m not really enjoying my fishing at the moment and for the first time in years, I haven’t fished somewhere on the Bank Holiday Monday. 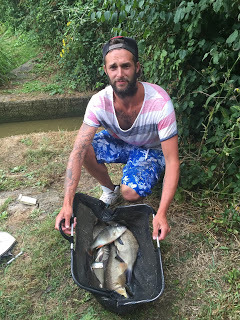 The trouble is the whip/short pole and the feeder are dominating out the pond at the moment and neither are methods I enjoy, Ash has been doing well fishing shallow for the big roach but basically he’s just doing it better than anybody else and even then his 19lb weights are only good enough to win the section! He’s also using a lot of caster and hemp and I just can’t justify (or afford) three pints of caster and the same of hemp to win a £20 section. I gave it my best shot today and I’m miles off the pace, even if I’d weighed the 15lb I thought I had, it still wouldn’t have been enough to win the section! For the last match I’m going to stick it out for big fish on the pole a bit like John did today, the trouble is it just becomes a bit of a lottery then but there’s no way I can win doing what I’m doing now. Anyway rant over, I’m looking forward to winter and the first frosts when the fish push out and the feeder becomes less effective and there’s also the river to look forward to. 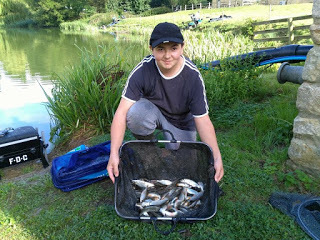 Coming soon – A look back to when I could actually catch fish at Dillington!